Styria, otherwise known as Steiermark, is the southern-most wine producing region in Austria. Unlike many other Southern grape-producing areas, the focus here is on whites rather than reds. The climate is largely Mediterranean and the region is known for brilliantly-fresh and elegant wines. A specialized focus on Sauvignon Blanc is complimented with other white varieties such as Chardonnay (known as Morillon here), Welshriesling, Traminer, Grauburgunder (Pinot Gris/Rulander.) Here, the wines are often fuller-bodied than their northern counterparts and rich with minerality due to the fossilized seashells in the soil. In November, much like in Beaujolais, a young wine known as a “Junker” is released which is a light-bodied, freshly acidic wine. In the spring, the “Klassik” wine is released which are those displaying intense varietal character with no oak aging. After a bit of patience, the “Lagen” wines are released which are usually produced from late-harvested/very ripe grapes from established single vineyards. In Styria, there is little interruption in the fermentation and maturation periods by the winemakers. As a result, the wines are crafted naturally which ultimately leads to a distinctive and genuine wine. 1.Weststeiermark in the western part of Styria, picturesque and undulating hills cover the landscape where spicy rose made from Blauer Wildbacher. 2. 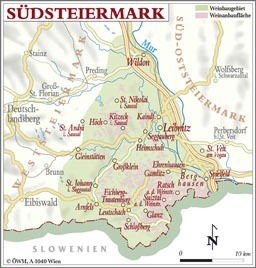 Südsteiermark is known for the region’s famous Savignon Blanc wines as well as acidic Chardonnay, Gelber Muskateller and Welschrielsing wines. Here the vines are planted on extremely steep inclines that make harvesting a challenge. 3. Südoststeiermark is the southeastern portion of the state and is often referred to as Vulkanland named for its volcanic activity. This region is known for cultivating the largest variety of wines in the entire country ranging from Chardonnay to Zweigelt. Unlike the other white-wine producing regions of Austria, Gruener Veltliner is the minority in Styria and Welshriesling trumps the other grapes in terms of volume. For a more focused understanding of each region in Styria visit http://www.AustrianWine.com.